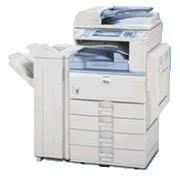 For productive printing and document management, the Aficio MP 2550 offers busy workgroups the power to perform. From image capture through file management and professional output, the Aficio MP 2550 delivers efficient, secure and cost-effective workflow that is integral to your business success. We ship all "OVERSIZED" freight items with "Commercial Trucking Lines" for Safe & Secure Transport. The "Trucking Company" will make your delivery at "Curb-Side" only! If you require delivery indoors, please check "LIFTGATE WITH INDOOR-DELIVERY SERVICE".